Our top priority is making sure you love your smile! We understand that selecting your dentist is a big decision. That is why for your first visit to our office we would like to give you a complimentary Exam and X-rays at no charge to you. 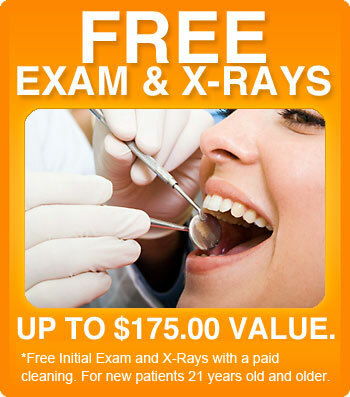 Regularly valued between $175 - $200, we will give you a Free Exam and X-rays with paid teeth cleaning. We want to give you a opportunity to visit our office, get to know our dentist and professional dental care team and see for yourself why thousands of satisfied patients keep coming back! Note: To redeem this offer simply call and contact our patient care coordinator. Act Now - Offer is valid thru Dec. 31, 2015. *Cleanings must be scheduled with Free Exams and X-rays. *Offer only valid with NEW Patients. Cannot be combined with any other special offers or dental service discounts.